Huacho is a beautiful place north of Lima, with pleasant, mild weather, and many farms famous for their mouthwatering avocados and mangoes, amongst other fruits. Huacho is also famous for the quality of its prepared food, especially for its sausages, which are very similar to Mexican chorizos but have a unique spicy and garlicky flavor. 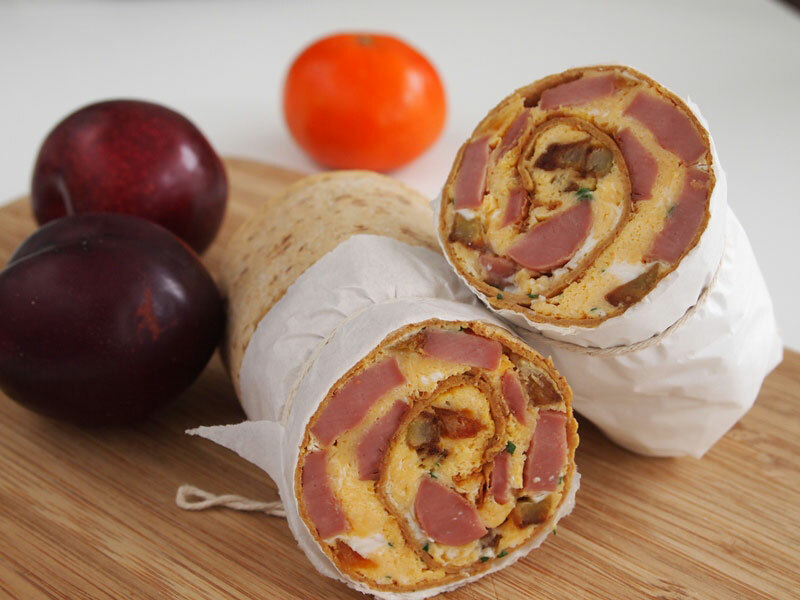 They are simply called salchichas de Huacho (Huacho´s sausages). Once in a while I love to have a traditional country breakfast of scrambled eggs made with crumbled and fried Huacho sausages. Some people add diced fried potatoes or yucca to this, and even make a hearty sandwich filled with the tasty preparation. 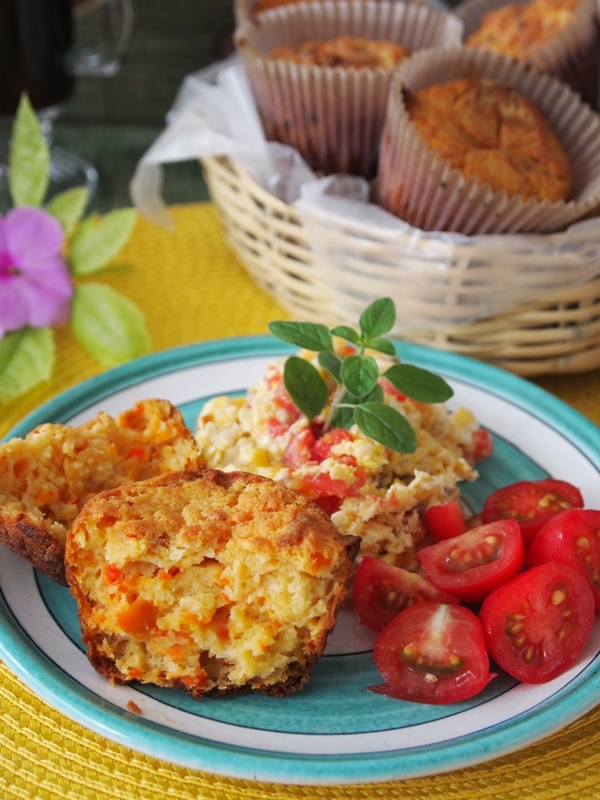 With these ideas in mind, and a bag of Maseca (one of my favorite ingredients) lying around in the kitchen, I suddenly had the urge to make corn muffins for breakfast, and add the brightly colored sausage to the preparaion. So I baked a batch and here they are in all their glory! 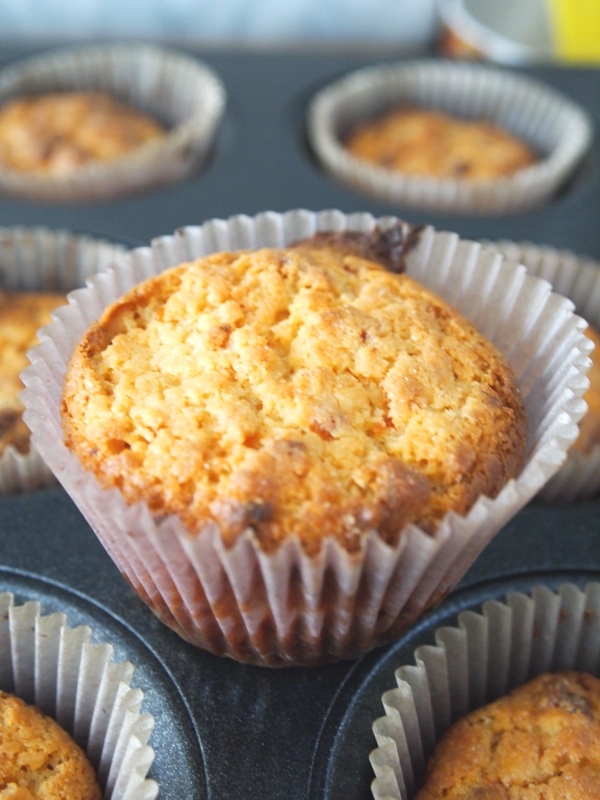 You won´t need instructions on how to save these muffins for later, because I seriously doubt they will last for long. 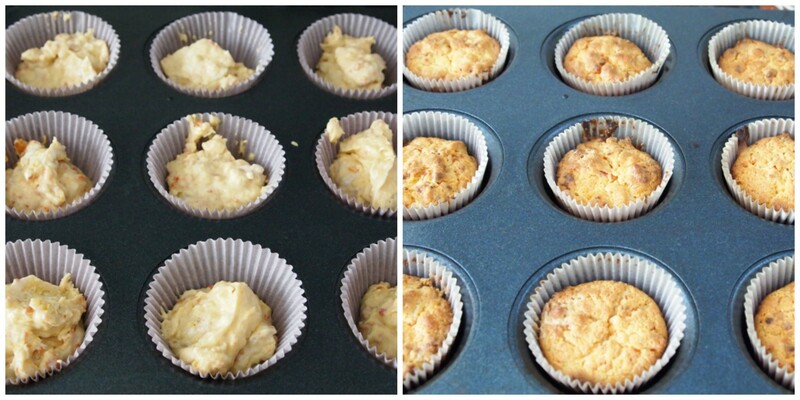 Making muffins is really easy but it has its tricks. First of all, you need to preheat the oven. 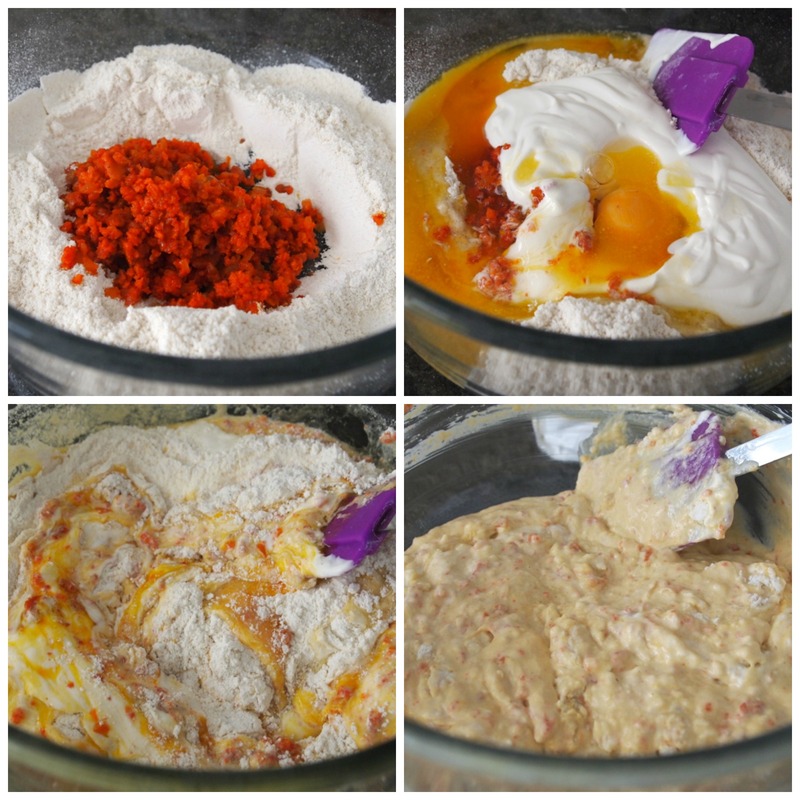 Then combine the sifted dry ingredients, make a well in the center, and add the liquid ingredients. Everything needs to be at room temperature when you do this. You won’t need a mixer, just a few strokes with a spatula -here less is actually better- to mix everything together, and that’s it. The batter should look lumpy, so don’t even worry about making it smooth. The baking time is short, just 20-25 minutes, but I like to start checking at 20 because I want to make sure the muffins won’t burn in the oven. 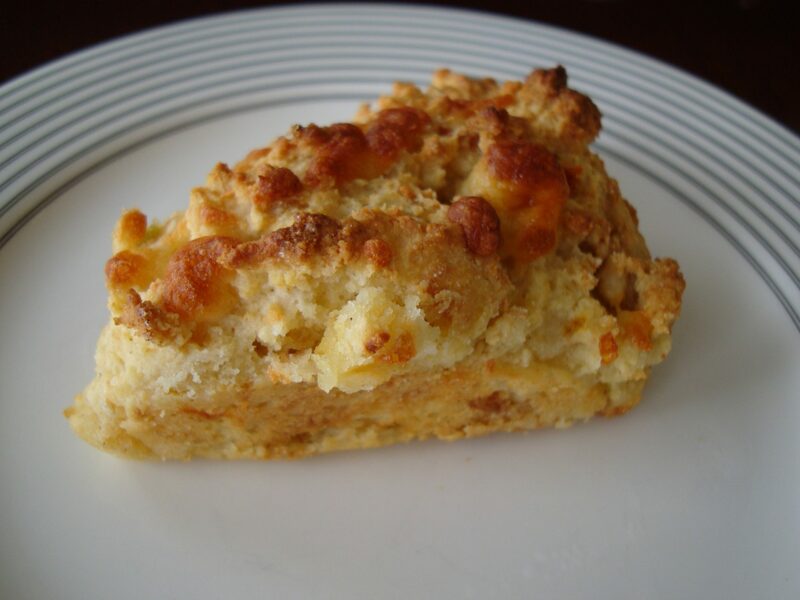 Maseca is a versatile ingredient that gives a melt-in-your-mouth texture to baked goods that I really love. That is exactly what it does with these muffins, and while you’re baking them your kitchen will smell like a real house in the country. To me this is the perfect way to welcome the New Year, don´t you think? Even though it’s not an ingredient usually used in Peru, I’m Central American, so I love to use Maseca in many ways. For instance, I can make Peruvian dishes with a twist, and so far, I’ve always been happy with the results. If you come visit me, I can make you some Peruvian tamalitos made with Maseca, and see what you think. Heat a pan over medium heat. Add the onion and the sausage without the casing, and stir until it releases its own fat and fries with the onion. Turn off the heat and cool. Sift the flour, Maseca, baking powder, and salt together. Make a well in the center and add the fried onion and sausage, melted butter, and sour cream. Mix everything quickly with 10 - 12 strokes. 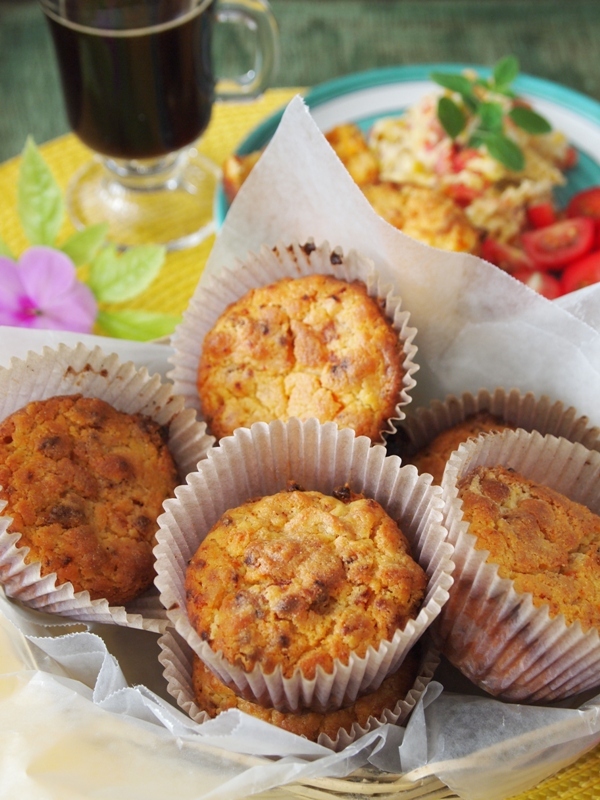 Scrape the batter onto paper lined muffin pans and bake for 25 minutes or until they have a nice golden brown color. Brush the tops with a little melted butter and serve. Yummy! 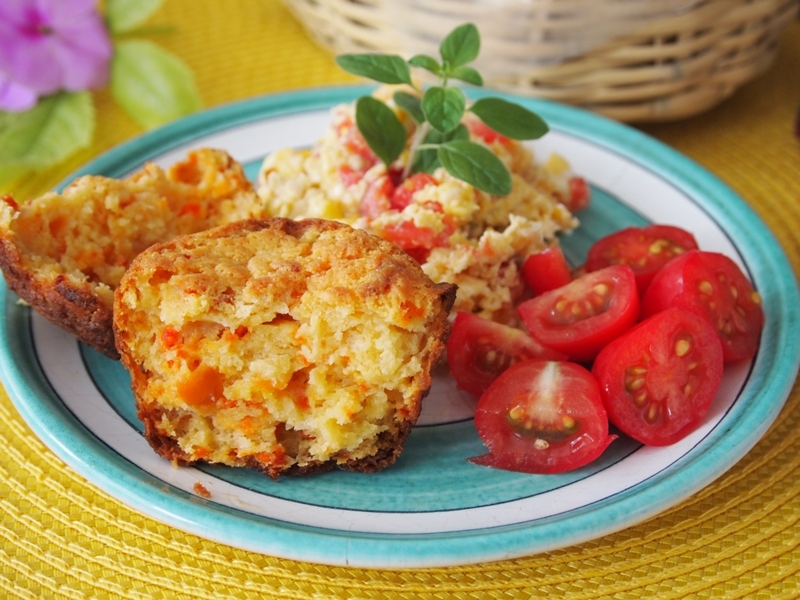 I love corn muffins, but I’ve never tried them with sausage. 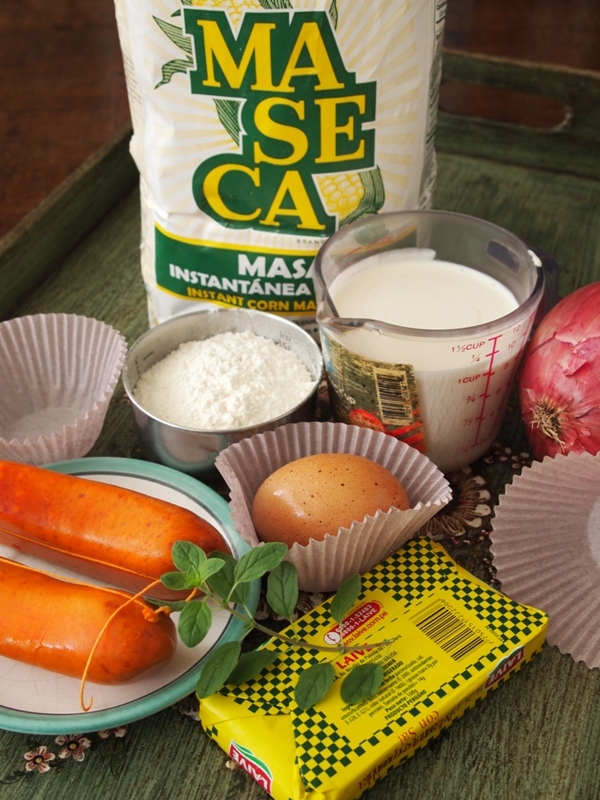 Maseca is also one of my family’s favorite ingredients for our annual tamales! Awesome photos. Thanks for sharing the recipe. I’m very intrigued and will look forward to making this. I seem to always have Maseca bags here and there that I would love to do things with aside from tamales. This seems like a great fit! Great! Let us know how it turns out. What do you usually use Maseca for? WHERE did u get salchicha huachana? 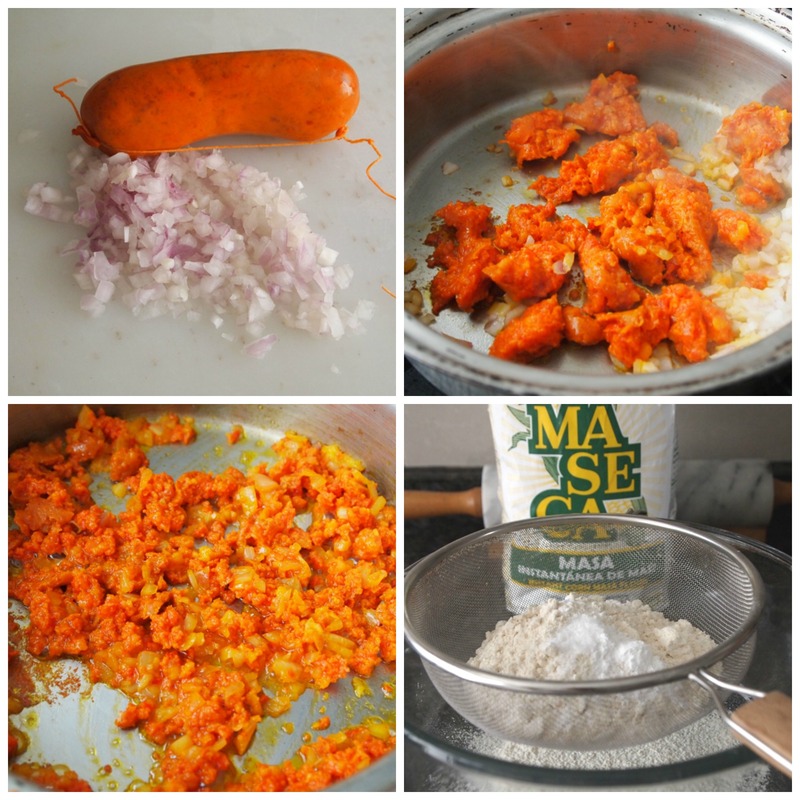 We buy salchicha de Huacho in Peru, but you can use Mexican chorizo. It´s flavor is similar, but choose the mild one.